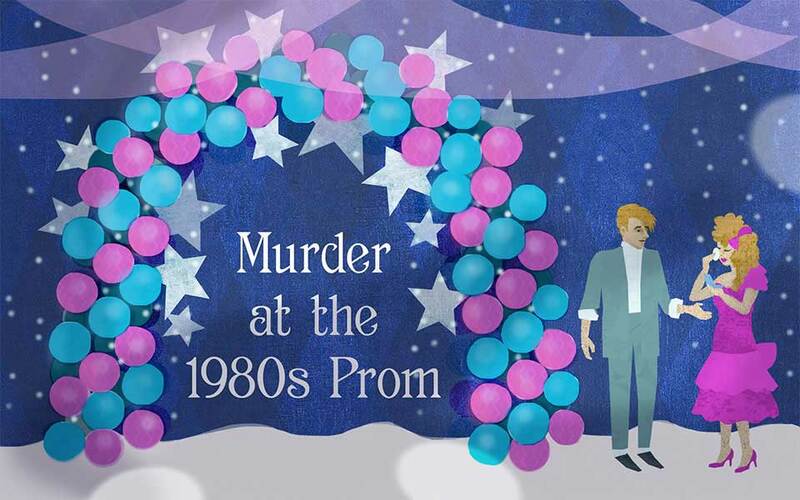 A 8 suspect mystery mystery set in a prom dance at a high school in the 1980s. Will accommodate an unlimited number of guests participating as sleuths. You will need a minimum of 8 suspects for this version of the mystery. Suggested investigation time is 2-3 hours. As with all of our mysteries, it is an INSTANT DOWNLOAD mystery package. Gladstone High class of 1987 has gathered for their prom, and what a night it will be! The hair is big, the dresses are puffy and the social hierarchy is the stuff John Hughes movies are made of. The big moment of the night ? the announcement of the prom king and queen, is at hand, but the nominees for prom king are no where to be found! Shortly after the big announcement, one of the nominees, jock Scott Mahoney is found dead in the boys locker room, having his head flushed in the toilet until he drowned!